When Is Eid Al-Fitr 2016 (Dates, meaning)? When do Muslims end Ramadan, fasting? Eid al-Fitr, the Islamic festival that marks the end of Ramadan for Muslims across the globe, starts on July 6, 2016 in the United States. (Reuters)Muslims are seen here taking part in Islamic prayers. 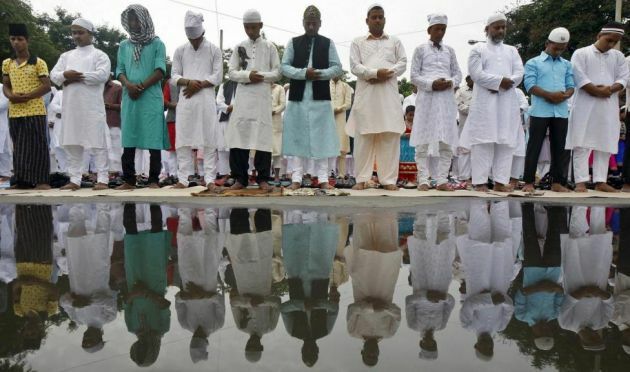 Ramadan marked a period of fasting and extra prayers for Muslims across the country, and on July 6 Ramadan comes to an end. This will mean followers of Islam across America will go out early in the morning on July 6 to pray at their local mosque or at a local designated prayer location. Over the past month, Muslims taking part in Ramadan have been fasting from sunrise to sunset each day, as well as abstaining from drinking and sexual activities. The time of Ramadan is marked by the festival of Eid al-Fitr, which takes place on a different date each year, as the period is measured according to lunar cycles not the yearly calendar. Of course as the lunar cycles can be slightly different in various parts of the world, the date for Eid al-Fitr can also be slightly different in different parts of the globe. Ramadan is the period that Muslims believe the Qu'ran - the Islamic holy book - was revealed to the Prophet Muhammad. Muslims hope that by fasting and taking part in additional prayers during Ramadan they can grow closer to Allah. Pregnant women, the elderly, as well as some with health conditions are often exempted from taking part in the long fasting period during Ramadan. Children are also not forced to take part, but many do take part with their parents for half day fasts.